This is another dish I cooked for dinner last weekend when my daughter was home for Thanksgiving break. This can’t be any easier with the slow cooker; just dump all the ingredients into the cooker, set it to low and stew it for 8 hours. Its another dish that I remember my sister used to cook for me back home. Boil 4 cups of water in a medium pot. When water boils, add spareribs and bring it back to a boil over medium high heat. Drain and transfer the spareribs into the slow cooker. Discard the water. Refill the medium pot with 4 cups of water and bring it to a boil. Add peanuts and boil for 3 minutes. The water will turn brown and cloudy, Drain and transfer the peanuts into the slow cooker. 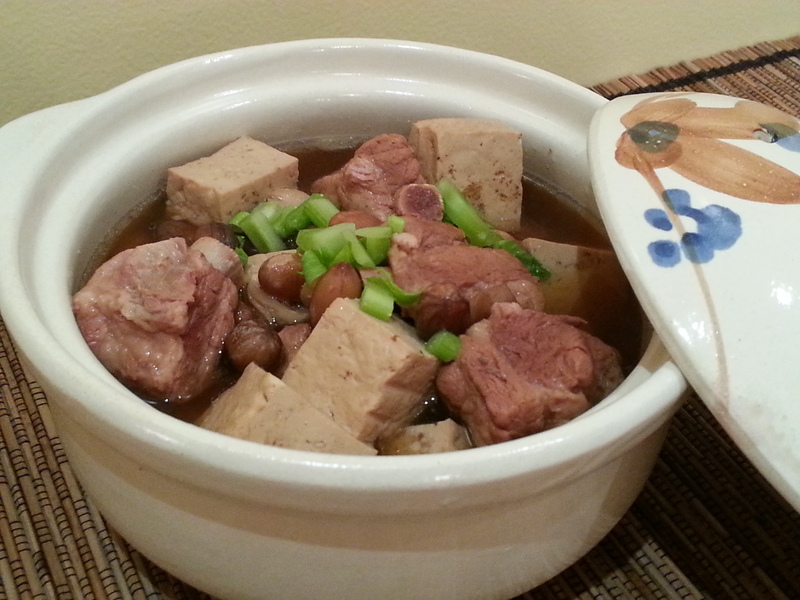 Add tofu cubes, garlic, salt, dark soy sauce, light soy sauce, sugar, and 6 cups of boiling water. Cover the slow cooker and set it to low and cook for 8 hours. Adjust seasoning to taste. Dish into a bowl, and garnish with chopped green onions and dash of white pepper. Serve with steaming jasmine rice.